Reviews for the previous books: one and two. This entire trilogy has been an emotional roller coaster. I laughed, I cried, I felt my heart breaking, but in the end, it was put put together. This is one emotional roller coaster that I'm thrilled to say I've experienced. 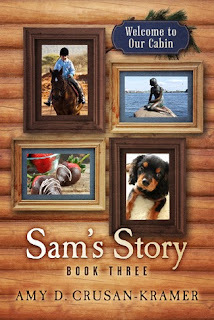 Amy is such a talented author and I'm so glad she contacted me about reading her books. Sam is such a powerful character. She's been through so many tragedies in her life, but she always comes out stronger. Her determination to have a happy life after all the adversity she's experienced is commendable. Watching Sam grow and mature throughout this series has been wonderful. Sam is definitely one of my favorite characters. As much as I love Sam, I'm also very fond of the other numerous characters. While this is (quite literally) Sam's Story, this story also belongs to all the other people in her life. This was a wonderful end to the trilogy. I'm so very happy that it ended the way it did. I couldn't have asked for anything better. If you're looking for an epic trilogy of tragedy and triumph, I certainly recommend this one.